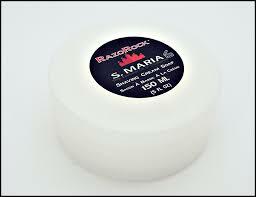 Probably a long shot but looking for a new or gently used tub of the discontinued S. Maria. Got about 1 shave left in mine. Can also trade a once used RR Tuscan Oud or something else. Soap obtained. Please archive. Thanks DFS! Freddiep318ti, can you compare this cream to some other similar like SMN or the RazoRock version SMdF? Also, glad to see you found another one. I have one myself & it's always been nice. I probably only have about 33% left. Hi Brian. One of my first soaps and one of my fave! This is just straight up eucalyptus and light menthol. No tobacco. Very Slick and one of my favorites during summer. Puts Proraso to shame! I will sometimes add a little KMF Peppermint for that extra cooling effect and scent and finish off with some Fine Platinum. If you like straight up Eucalyptus, try to track down some of the old RR 888. It had the same base as Acca Kappa from what I know. They (888 & King Louis) contained Lanolin & Shea Butter if that matters. My favorite RR soap base.